How To Take Control Of Your Home And Your Mind: Create A Haven Of Peace And Tranquillity! Clutter exists in many forms and you can be sure that wherever it is physically taking up valuable space in your home, it is also having a negative impact on your emotions and self-esteem! 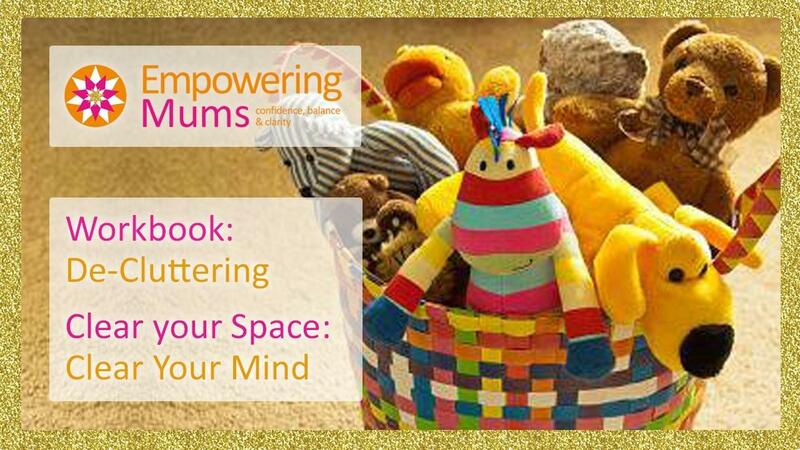 Empowering Mums has produced the De-cluttering: Clear Your Space, Clear Your Mind self-study guide to support you in your de-cluttering efforts. This essential guide to de-cluttering provides effective and long-term solutions to re-organising your home, which will enable you to create and maintain a peaceful, tranquil environment that the whole family can enjoy. This self-study guide has been structured in a workbook format, so you can manage each area of your home in an organised, methodical way. Space has been provided for you to make and keep notes, add personal goals and answer task questions. By reading this self-study guide, you will discover exactly how to take control of your home and your mind, feel an immense positive calmness and experience a powerful energy boost, which will all enable you to attract and invite the new into your life as you make way for a fresh start. As you work through each interactive task, you will learn how to let go of the past, clear out the old, organise your surroundings, put effective systems and best practice into place and create a haven of peace and tranquillity that will enable you to fully relax and enjoy your home. This invaluable guide will empower you to tackle your clutter once and for all. On completion, you will feel invigorated, cleansed and, most importantly, in control of yourself and your surroundings. Clutter was holding me back from my vision of a perfect home. One of the major impacts of clutter was on my relationship with my husband. It was driving him mad effecting his "Chi" and so I was constantly feeling guilty and disorganised. Clutter was dragging me down! There are SO many things I have learnt from this Decluttering: Clear Your Space, Clear Your Mind Guide. My number 1 learn - is that it’s OK to get rid of clutter! Give yourself permission. Let it go. Relinquishing my clutter gave me a very strong sense of clarity. A huge weight lifted. It allowed me more space mentally and physically in my life. AMAZING. The workbook shared so many great tools, techniques and exercises that were so simple but really effective. You can walk away with these in your pocket implementing them forever as daily habits to maintain your clutter-free home and mind! This invaluable guide will empower you to tackle your clutter once and for all. On completion, you will feel invigorated, cleansed and, most importantly, in control of yourself and your surroundings!